Submitted photo Ratatouille takes a little extra effort, but the results are worth it. Our children were young. I think Daphne was six and Jack was four. It was the perfect spot to marinate our children in love, which was our motto. Little did we know that this was only the tip of the iceberg. We still had lifelong friends to meet, parades to attend, and plays and karaoke to take part in. A few years into living a wonderful life in Hanska, I decided to build a garden. This was undoubtedly a labor of love. I planted potatoes, eggplant, onions, sunflowers, watermelon, zucchini, green beans, tomatoes, peppers, and more. I think I was out there tending to that patch of land every day. I slathered on sun block, sprayed myself with bug repellant, put on a silly hat and headed out. I became friends with robins and learned not to fear worms. Then, vegetables and fruits began to bloom. I was astonished at how much I created. Well, the amazingly fertile Minnesota soil, sun, and water took part in it. I bought a big basket to carry in my bounty every time I picked what was ripe. Every couple of weeks, I laid everything on the kitchen counter and took photos. Then, I had to figure out what to make with all of this food. Usually, I made a few care packages to hand out to friends. I learned how to can. I made salsa, ketchup, and spaghetti sauce. I froze green chili. It was a blissful time. One day, I came in with lots of tomatoes, eggplant and zucchini and asked Claud what I should make with all of this. He instantly said, “Ratatouille.” I had no clue how to make this and he took the time to walk me through the steps. This ratatouille was so delicious. It is more time consuming than one would imagine, but the end result is so well worth the effort. It is a dish you have to slowly cook and love each step of the process. It is much like tending to a garden. That night, I wrote an article about the garden and the ratatouille. I then, sent this to The Journal, along with a letter asking if I could write a weekly column. Much to my surprise, I received a call from the editor, Kevin Sweeney. He thought a weekly food column would be a nice addition to the paper and, just like that, I was on board. Since then, and I believe it has been over nine years, I have written an article related to food for the newspaper every week and this too has been a labor of love. I am so grateful to Kevin Sweeny to have given me this opportunity. It has taught me so much. For instance, don’t send him 21 photos of the process and then forget to attach the article. Also, don’t try to call something cute, like “eggy bread” when it is really just French toast. No, really, I was never a chef or trained in nutrition. 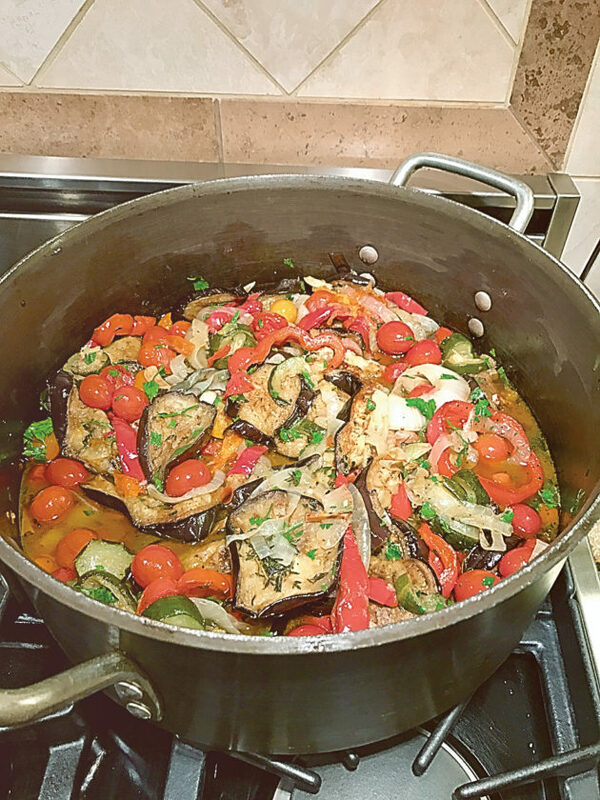 However, because I had this article to write each week, I have learned so much about health, nutrition, international foods, cooking, cultures, and ingredients. I am sure I wouldn’t have pushed myself to understand as much as I now do. Now, the time has come to end my food column. Over the years, I have appreciated all of the feedback from friends and people I don’t know. I hope if anyone wants to continue following my food related ideas and recipes will do so via Twitter @simplyfoodify or follow my facebook page Simply Foodify. I haven’t been keeping up with the Facebook page for a while but will get back into updating it now. I also welcome anyone to add me as a friend. I always accept friend requests from anyone in New Ulm and Hanska. I don’t ever want to lose my connection with people in this area, as living there was one of the most magical times of my life. I thought it would be nice to end my column with my very first recipe. So, here it is. Get out there and plant those gardens so you can make this amazing dish. If not, just go to the store and buy the simple ingredients. It seems uncomplicated but the flavor is anything but. It can be served with crusty bread, pasta, or salad. Thank you everyone who has read my articles, especially if you made some of these dishes. Each and every recipe was designed with a passion for food and for life. Heat 2 tablespoons of the oil in a large skillet. Have a Dutch oven ready to the side. Add zucchini to the hot oil and sauté until they turn dark green and are a little soft. Sprinkle on some salt and pepper. Place these into the Dutch oven. Add the onions to the skillet. You can add oil as you go as it is needed for each layer. Sprinkle with a little salt and pepper. Sauté until translucent. Place into the Dutch oven. Then, sauté the eggplant. These will need more olive oil because they soak so much up. Sauté until soft. Add to the others. Saute the garlic in the skillet for two minutes and add in the tomatoes. Sprinkle with salt and pepper. Toss these with the other vegetables in the Dutch oven. Throw in the thyme. Cover and place into the oven for 30 minutes. Uncover and cook another 20 minutes.